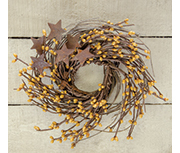 This small pip berry and twig wreath has rusty metal stars and is great for accenting your prim wall decor. Features gold/tea-stained colored pip berries. Diameter is approximately 10 inches.